Olympics - lake Placid , N.Y.
Langley Air Force Base Virginia. 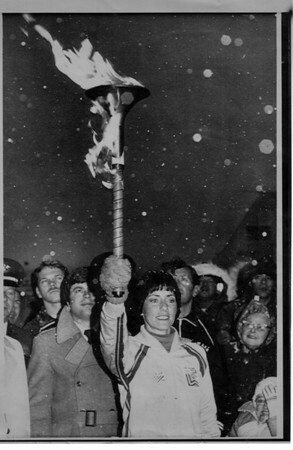 Snow falls heavily as Sandra Norris of Indiana holds the official Olympic Torch high above her head after it had arrived from Greece. The Torch will be ran from Virginia to Lake Placid , N.Y. site of the 1980 Winter Olympic Games.